Chelsea’s strength and dominance this season has been less about the quality of their individual players, but more from the team’s performances as a slick, united and competitive unit. It’s been quite usual to find Hazard, Oscar and Willian winning tackles deep inside their own half, with right back Ivanovic occasionally the most advanced Chelsea player when the team counter attack. 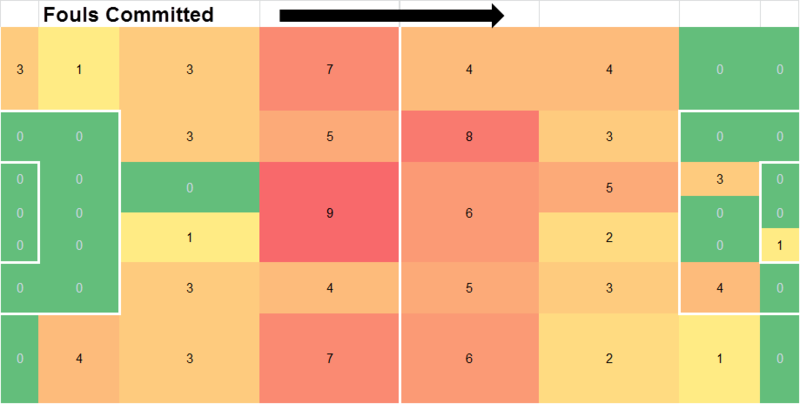 Their competitiveness can be seen not so much in Chelsea’s foul count, but in the location of most of their fouls and in the players who have committed the fouls. 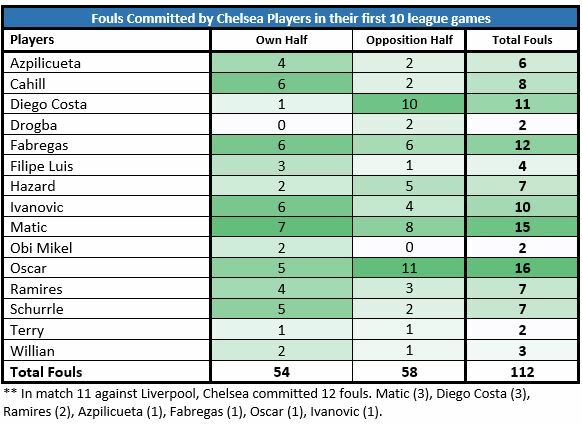 Chelsea averaged little more than 11 fouls per game, which is average for the Premier League; with the commanding Nemanja Matic committing most fouls. Of his 18 offences, 13 were committing around the centre circle, eight in opposition territory and only one close to his own penalty area. Even after being cautioned, Matic remains just as competitive, but the influential Serb has so far been intelligent enough not to commit a foul which would warrant a second yellow card. With one fewer foul, but from two fewer games is Oscar, who frequently acts as Chelsea’s first line of defence. The majority of his fouls have been committed in opposition territory and have tended to slow down and stop possible opposition counter attacks. Five of his fouls were committed in his own half, all of them close to the half way line, with none in threatening areas. In Chelsea’s match against Arsenal back in October, Oscar committed four ‘niggly’ fouls in the opening half, but was only cautioned for his fifth foul in the 85th minute, much to the ire of Arsène Wenger. Remarkably Chelsea’s back four has committed only a quarter of all Chelsea fouls, with fewer than 10% occurring in defensive areas. Even more remarkable has been the performance of John Terry, who has played in every minute of every Chelsea league game, yet has committed only two fouls, one in his own half the other inside the opposition penalty box. But whilst Chelsea’s high pressure tactics have proven to be effective in breaking up opposition attacks, preventing rapid counter attacks and regaining possession; there has also been a price to pay. Despite committing an average number of fouls, Chelsea have picked up the second highest number of yellow cards and two red cards. Both Fabregas and Diego Costa have accrued four yellow cards, which leaves them one card away from a suspension. In their match against Manchester United at Old Trafford, a foul by Ivanovic, his third of the match, deep into injury time, was harshly punished not only with a second yellow card, but with an equalizing goal for the hosts from the subsequent cross. Whilst there is still a long way to go until the end of the season, so far Chelsea’s tactics have more or less been spot on. Defend from the front, if you have to commit fouls, do it as far from the defensive back line as possible and where possible share the fouls around. As long as Chelsea don’t suffer serious injuries to key players, it looks as if it will take a very special effort from some of their rivals, to prevent the Blues from capturing the title and for Jose Mourinho to once again to win a league title in his second season in charge of a major club.